The mission of the National Veterans Foundation (NVF) is to serve the crisis management, information and referral needs of all U.S. Veterans and their families through: Management and operation of the nation's only toll-free helpline for all veterans and their families. Public awareness programs that shine a consistent spotlight on the needs of America's veterans. NVF offers outreach services that provide veterans and families in need with food, clothing, transportation, employment, and other essential resources. The founder of the National Veterans Foundation, Floyd ‘Shad' Meshad has been working with Veterans since 1970. Meshad was a Medical Service Officer during the Vietnam War, where he counseled soldiers in the field who were suffering from a multitude of psychological and emotional problems resulting from their experiences in combat, including what would later become known as ‘Post Traumatic Stress Disorder,' or PTSD. 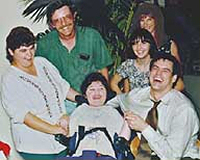 Jim Carrey was Honorary Chairman for the National Veterans Foundation (NVF) A-PAC-A-LAFS-NOW (Apocalypse Now) comedy event in June 1995, held at The Comedy Store in Los Angeles. He had appeared at six of the seven previous engagements, but his filming schedule on "Ace Ventura: When Nature Calls" kept him out of the event this year. Carrey said of the event, "The foundation (NVF) has gained a lot of support from the comedy world. Many of us have tremendous respect for the work that is carried out by NVF on a daily basis. Using comedy to heal and help those less fortunate is a great thing." Jim Carrey's ex-wife Melissa was the Event Chair of 1995's charity event.